Because we’ve been asked about this article, we are reposting the Vallejo Times-Herald story featuring our mobile bookstore back on November 11, 2008. Enjoy! Reading a book starts with a single page, and that’s the kind of approach Charles Chatmon, author and book fair organizer, is using to reach his goal of opening a book store. In Vallejo, where places to find favorite authors are few and far between, a bookstore has been a long-held desire of many officials and residents. Before trying to open a store, Chatmon is taking a samplings of used books on the road. 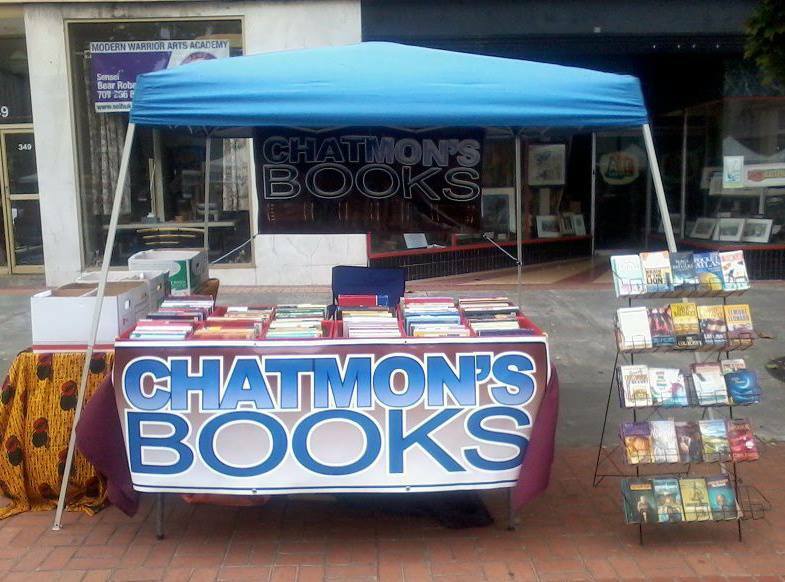 Saturday mornings, Chatmon’s mobile bookstore can be found in the farmers market in downtown Vallejo. There he sells mysteries, romances and classics while also telling people of his plans to open a store featuring new and used books, plus magazines, newspapers and CDs. Part of a circle of local writers and artists, Chatmon and his partner, Chandra Adams, also aim to bolster the city’s literary scene with writing workshops, book discussions, poetry walks and festivals. A Vallejoan, Adams wrote the novel “Shades of Retribution,” a mystery and thriller. He said the need is big for people to buy new and used books, and for local authors to showcase their works. He is currently surveying residents on what they would like to read and how they might like to help establish the book store with donations and other help. Vallejo real estate property and asset manager Steve England said he’s talked with Chatmon on ways the city could help him. Chatmon is the author of two poetry collections — “The Depths of My Soul,” and “The Voices of South Central.” He is the executive director of the Los Angeles Black Book Expo last held in June. He works as a professional proof-reader, and is a freelance writer and former middle school teacher. Mar L is the author of Everything a Woman Wants to Hear First Thing in the Morning, a daily devotional which is also described as a ‘new form of romantic fiction and entertainment’. In this clip taken from the 2013 Los Angeles Black Book Expo, Mar tells the viewers what we can expect. It’s available at Amazon.com and Mar’s website below. Atlanta native now living in Los Angeles, author Shaneka M. Johnson is the proud writer of Love and Deceit: Affairs of the Heart and her new book, Love and Deceit: Unfinished Business. Both of her books and details on where readers can find her are on her Facebook page; ThatAuthorJohnson. Here she is at the recent Los Angeles Black Book Expo discussing her recent Love and Deceit: Unfinished Business. Shashana Page is an author, founder and CEO of Lost Page Publishing. Raised in the Inland Empire city of San Bernardino, her debut novel Intuition, a tale which has caught a lot of attention and is in the Chatmon’s Books inventory. Watch Shashana’s video to discover more about her, her book and Lost Page Publishing. You can also visit her website at http://shashanapage.com. We would like to introduce Ms. Tracy Brooks, the author of “Dancing in the Rain: Finding Peace Through All The Pieces”. This is her recent showing at the 2013 Los Angeles Black Book Expo where she describes what’s in her debut book. You can find her on Amazon and Google Books. No website for her as of yet.